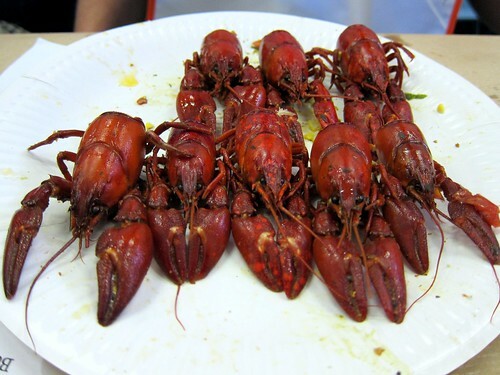 What a pleasure it was to attend the Louisiana-style Crawfish Boil on Thursday evening hosted by the lovely Bea’s of Bloomsbury. Located at their Diner in a Maltby Street archway it was advertised as a proper Southern style party and a feast not for the faint-hearted – they were not kidding! We arrived to rows of communal tables laden with a variety of sauces, bibs and very necessary giant rolls of kitchen towel. Rubbish bags were attached at the ends of the tables. Things were going to get messy. This definitely looked like my kind of party! 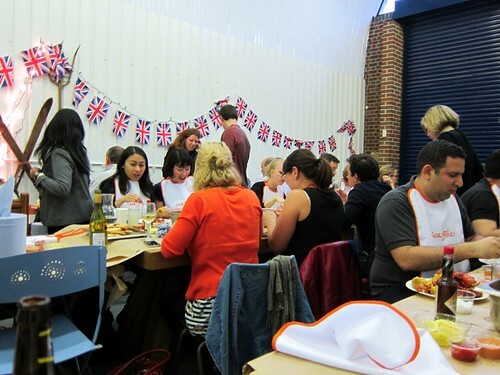 It was not long before the trays of food arrived and it was time to put the bibs on. In fact mountains of food arrived. 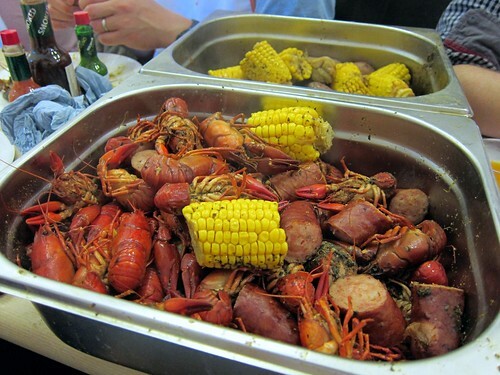 There were trays of garlic bread and a never ending stream of trays piled high with steaming crawfish, sausage, corn and potato. I loved the corn which was so sweet I thought it had been boiled in sugar but it was in fact amazingly all natural and served coated in a very spicy BBQ rub. The polish sausage was also exceptionally flavoursome and delicious. There were an excellent range of home made sauces including cocktail sauce (chunky tomato and horseradish), comeback sauce (which sounded like it contained everything from Bea’s description of it which included mayo, ketchup, garlic, chilli and worchestershire) and cajun butter. They were all very good and I found myself dipping anything and everything I could into them including the garlic bread and potato which I tried not to fill up too much on. Soon the shells piled up and I was feeling extremely full and satisfied, safe in the knowledge that I was helping the environment by eating what was essentially an American pest that has overtaken British rivers. Good job me. And nice work to Crayfish Bob for supplying the crawfish. 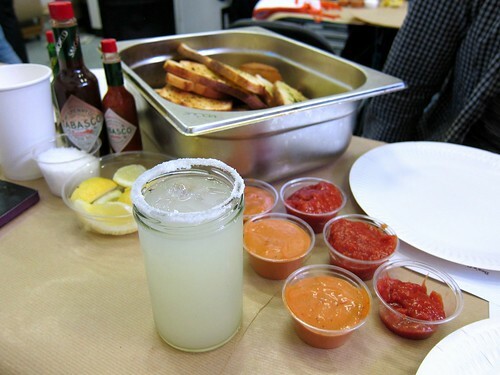 They also served up a mean margarita. I had thought they seemed strong and as it turned out they only consisted of tequila, triple sec, and some lime juice as they’d forgotten the shaved ice. 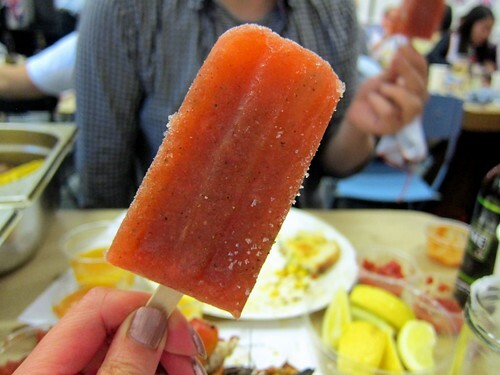 Dessert consisted of a range of ice lollies which made a very welcome and refreshing end to the meal. I had the Pimms ice lolly which was lovely with flavours of cucumber and strawberry. We left ridiculously full, contented and a little in awe at the fact the crawfish were still coming out of the kitchen and that the Singaporean couple at our table who were still going strong at it and peeling away. “Zero calories” one of them had said with a nod, referring to how the energy expended in peeling them cancelled out the calories consumed when eating them. Sage advice indeed. 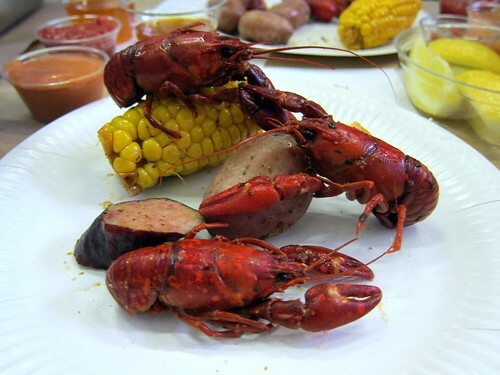 We had a very enjoyable evening at Bea’s Crawfish Boil. There was a great atmosphere and good tunes on the sound system. Highly recommended to seafood lovers who are happy to be bombarded with food. This was very much an all you can eat event and good value at £24 a ticket (excluding drinks). 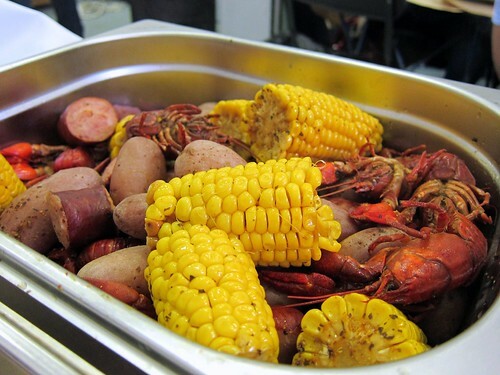 Tickets to remaining Crawfish Boils are likely to sell out soon, so get in quick. And don’t forget your fat pants! I like your “Cray heads” photo. Wow!! That looks amazing! Luckily I already have a ticket for the boil on the 24th!! Thanks for sharing this, ‘now I know what to look fOrward to! Cheers Mondomulia – you’ll have a great time I’m sure! Actually what he said was ‘negative calories’ cos it takes so much effort to get the meat out…especially if you bother to try and do the claws. Ah… negative calories = even better!! This is AMAZING! Wish I would have seen this earlier! I see they still have dates available and WE ARE GONNA PASS A GOOD TIME CHE’!